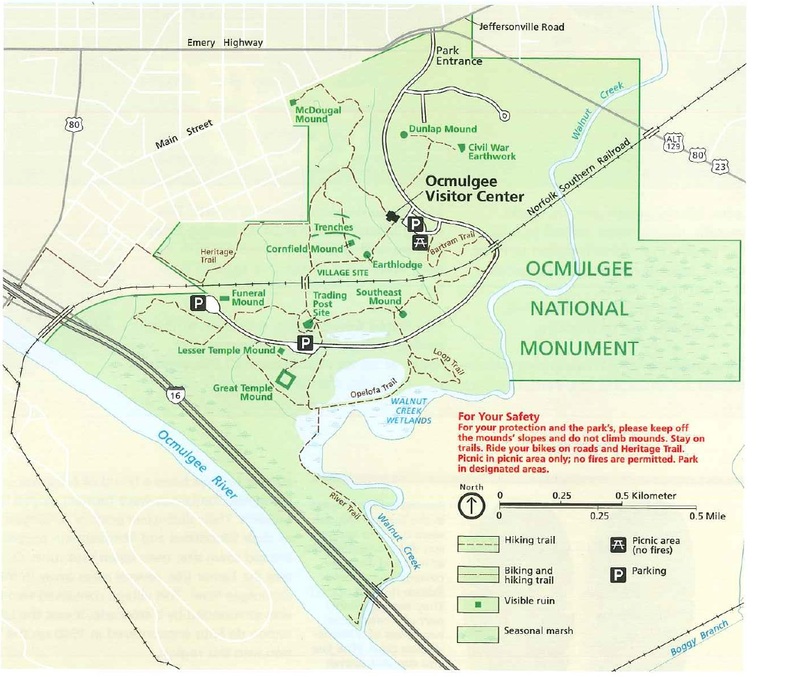 The Ocmulgee National Monument, located on the Ocmulgee River in Macon, GA, preserves 702 acres of prehistoric mounds and other earthworks built on a site that has been inhabited by Native people for an estimated 17,000 years. The site came under the protection of the National Park Service in 1934 and was placed on the National Registry of Historic Places in 1966. 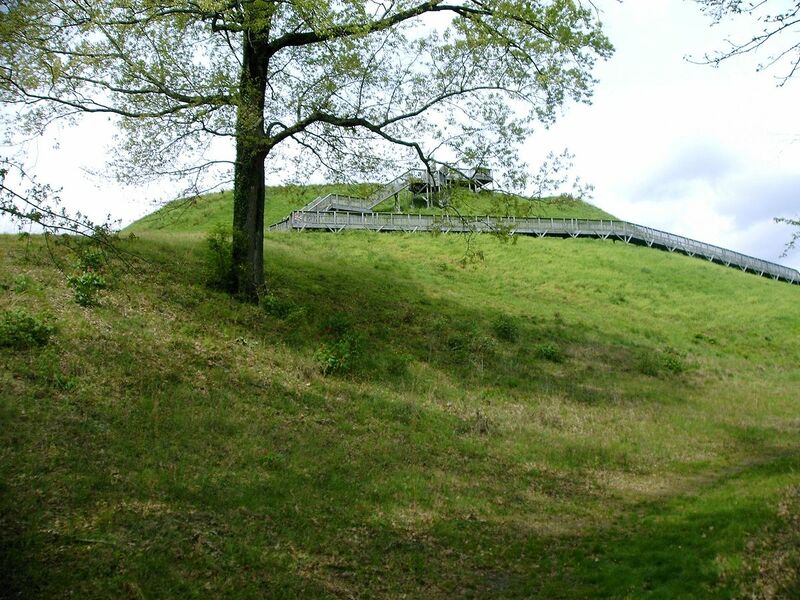 Although people have been living and hunting along the river since the last Ice Age, the seven mounds located in the park were built by the South Appalachian Mississippian people around 900 AD. The largest earthwork is the Great Temple Mound, which is 55 feet high and has a wooden stairway that visitors can climb to take in the view from the top. Nearby is the Lesser Temple Mound, and the park also includes a burial mound, other small ceremonial mounds, and defensive earthwork trenches. In addition to the mounds, the park includes six miles of hiking and biking trails, fishing and picnicking areas, and an 800 foot long boardwalk over wetlands. There is also a historic railroad bridge, some civil war era landmarks, the historic site of an English colonial trading post from 1690, and a reconstructed ceremonial earthlodge, the floor of which is the original one thousand year old floor of a Mississippian earthlodge. Two more mounds and the remains of a palisade and village are located three miles away at the Lamar Mounds and Village Site. The Lamar culture developed after the decline of the Mississippian culture around 1300 AD. 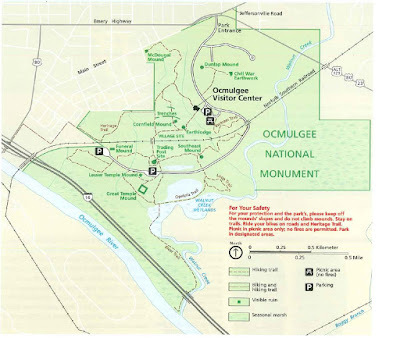 The Lamar site is part of the Ocmulgee National Monument park but is accessible only by a park ranger-guided tour and four mile roundtrip hike (call 478-752-8257 for details and reservations). 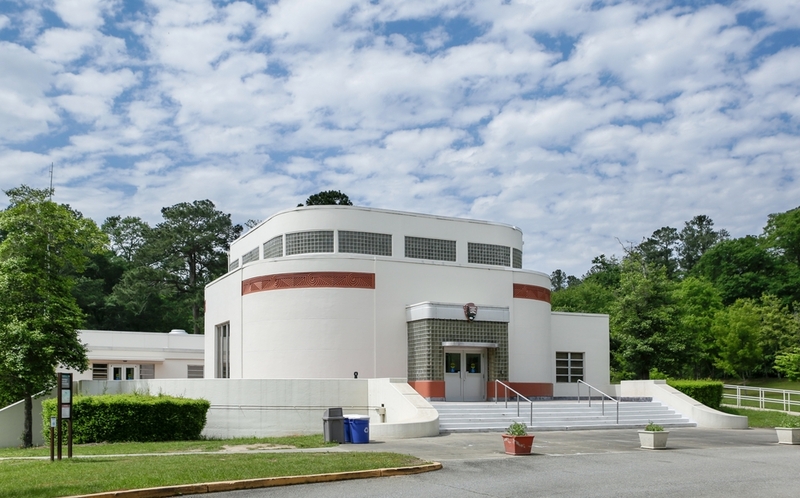 Inside the striking, terracotta and white art moderne Visitor Center, there is a gift shop and a small theater area presenting a short orientation film, "Mysteries of the Mounds." An archaeology museum displays thousands of artifacts from excavations that have taken place onsite. Other exhibits detail the history of the Ocmulgee River location, including the rise of the Muscogee (Creek) Confederacy from the descendants of the Lamar people whose culture and population was decimated by disease spread by Hernando de Soto's expedition in 1540. Two special events are held at the ONM each year, the Lantern Light Tours in March and the Ocmulgee Indian Celebration in September. The Ocmulgee Indian Celebration is the largest Native gathering in the Southeastern United States and represents all the tribal nations from the region through hundreds of craftspeople and music, dance, food, storytelling, and more.